Just over a year ago we tore everything but the bathtub out of our hall bath. We were ready to renovate! 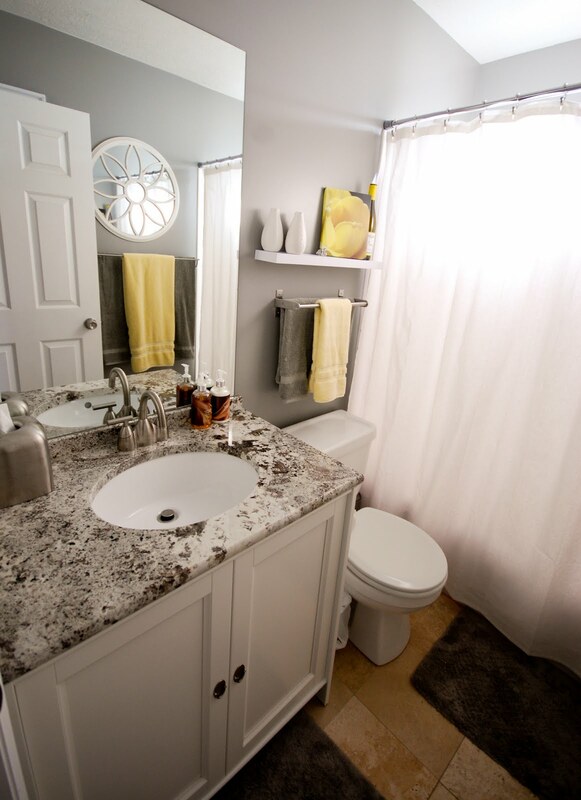 We had just finished renovating most of our home and this was our third bathroom out of four that needed to be done. About a week after we tore everything out (and hadn't started putting anything back in) I quit working. I took three months off of work for personal reasons. The problem was, this time off of work was not planned. So we didn't dare use the money we had set aside for the bath renovation anymore. The bathroom sat gutted for about eight months. The good thing was that it isn't a bathroom we ever use. Nonetheless, it drove me crazy having an empty, dirty bathroom with a toilet in the tub for months on end. By the time we were ready to think about this bathroom again plans had changed. This bathroom needed to be done on an extremely tight budget. I renovated this entire bathroom for under $750.00! I am more than humiliated to show the before picture here, but it has to be done to show you all how ugly our bathrooms were. 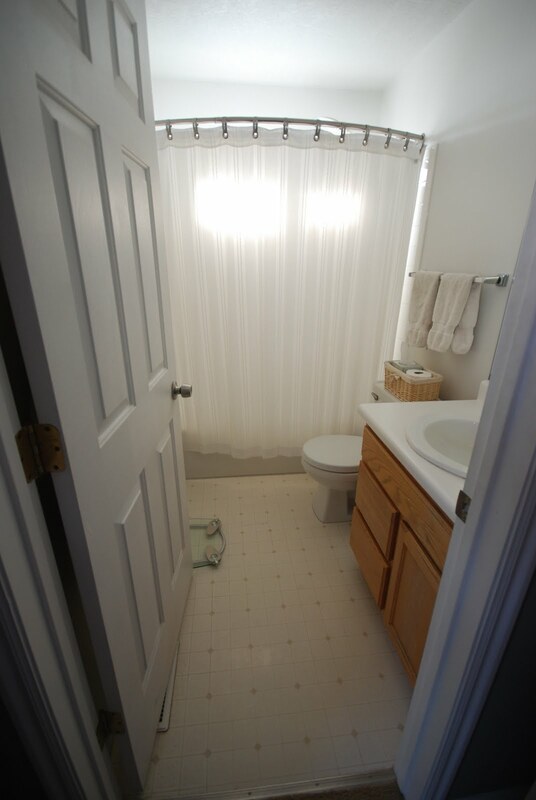 This actually isn't a before photo of the exact bathroom, this is my Master Bath. They look exactly the same though and are the same dimensions, the layout is just swapped. Let me swallow my pride first. Gulp. I guess I should be grateful it's not an avocado green toilet, tub and sink with carpet. Still, it's quite "builder grade". Hideous yellowy oak cabinet, ugly linoleum, white laminate countertops. Boring. So after much penny pinching and DIY-ing, here are the after photos! Here's the cost break down (as best as I can remember). The flooring is 12" x 12" Ankara travertine that I bought at Arizona Tile. I bought it when I worked there (over six years ago) so I really can't remember what I paid for it at the time. It was actually the "classic" version though, so I know it was pretty cheap (classic means B Grade). I only needed about 30 square feet (sad I know), so I'm going to guess it was about $120.00 for the tile ($4.00 a square foot). I had my tile guy do the baseboards out of the tile too. I like that so much better than wood baseboards in a bath. I paid my tile guy $240.00 for his labor and setting materials, which was $8.00 a square foot. I already had grout from previous tile I'd done. I kept the white 4"x4" tiles that were on the shower/ tub walls. I really wanted to replace them as well as the tub, but it was something we had to live with given the tight budget. We also kept the old toilet. The paint is a grey color from Behr. I actually used this color in my Master Bedroom and had some left over. I also had some white paint left over that I used to paint the trim. The cabinet was probably the biggest obstacle for me. I needed something fairly specific and had a really hard time finding it based on what I wanted to spend. I compromised a little, but overall I'm pretty happy with it. I needed it to be 30" wide because I wasn't replacing my mirror. I looked everywhere locally and online including couldn't find anything! I found some cabinets that came with countertops, but I didn't need a countertop! Also I had a hard time finding a 21" deep cabinet (they only had 18" deep, which I hate). One day at my local Ikea I found something I liked but again it was 18" deep. I came home and got online and noticed that they did have a 21" deep one, they just didn't have it on the showroom floor. Luckily their website even gives you the bin number of where to find it in the store. I know Ikea isn't the highest quality, but I only paid $100.00 for this cabinet! It must have been discontinued, I can't find it on their website anymore. 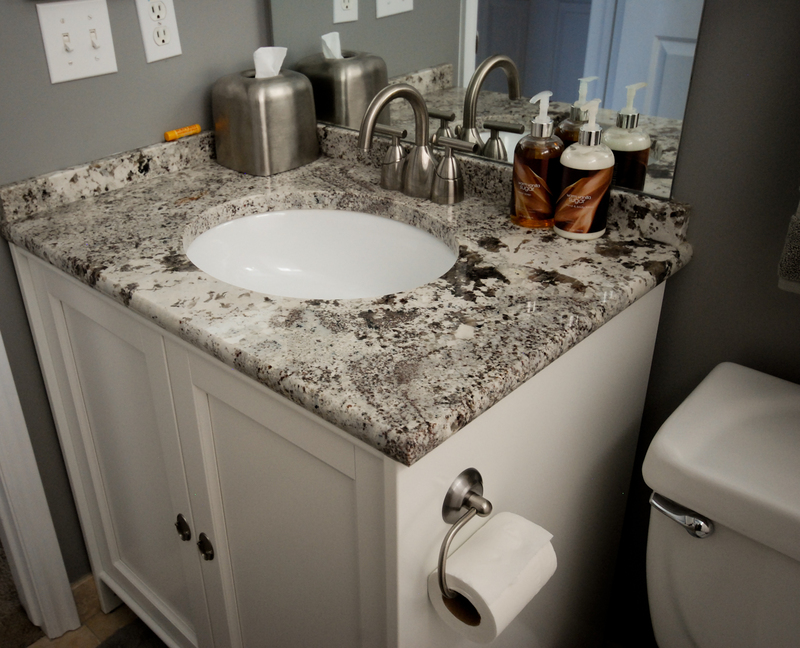 The countertop is Delicatus granite. Obviously I got this for free being in the granite business and all. I did use a remnant from our yard though. The edge detail is a 1 1/4" Half Moon. My husband installed it, so the retail price, if you were to pick up and install this yourself, would be $210.00. That includes the backsplash. I had to do a 2" splash, again because I didn't want to replace my mirror. I thought it was going to look weird but I actually really like the shorter splash. The granite was 3 cm (1 1/4") and I didn't want the space to be tight for the faucet, so I had the shop guage the splash down to 3/4" thick. I like this better for small vanities. The sink came from my local supplier. Honestly I got a deal on this as well, but it retails for $40.00. Which is still a really great price. The faucet I just bought at Lowe's, if I remember right it's a Delta. I don't love this faucet, I wish it wasn't sitting on that base. I like the three hole faucets that sit directly on the stone much better, but this was cheap. Only $49.00 on sale! I bought the towels, shower curtain, curtain rod, curtain rings, tissue holder and shelf above the toilet at Target. Total $150.00. The two rugs are Martha Stewart, I bought them at Macy's on sale for $32.00. The flower mirror above the towel rack and the vases (from Ikea) were gifts. I actually got the mirror at my bridal shower over 10 years ago! I got the toilet paper holder and both towel racks at Ikea. Spent $40.00. I took the picture of the flower on the canvas. I had it printed at Canvas People for free. Seriously! It was a deal I found here, I only paid $14.95 for the shipping. Behind that is just an empty Cupcake wine bottle that happened to match my decor. I think that's it. That brings the grand total to $746.00! Had I paid for the countertop and sink that still comes out to $996.00! I know this isn't the fanciest renovation I've shown here, but do you think it was worth $750.00? I certainly do! It's been so nice to have this bathroom put back together. My next project is my Master Bath! Stay tuned. I seriously can not believe you did this for under $750.00! I really like the gray with the yellow. The granite is very pretty too. This is so good to see. I too have a "builder grade" bath. 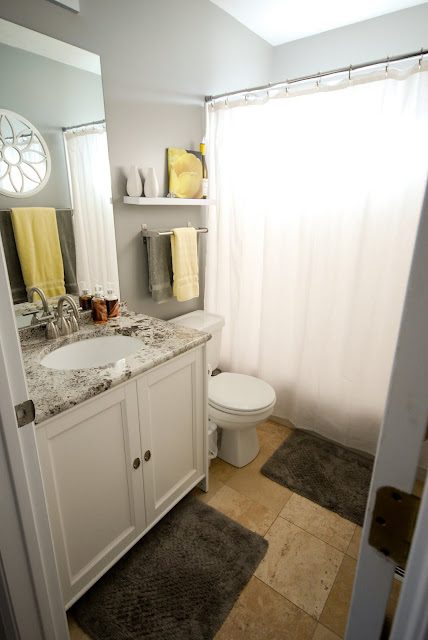 I don't have a big budget, so it's nice to see that updating my ugly bath is obtainable. Love it! You are right about the avacado green, you can be thankful you didn't have to deal with that. (I did). Blech.